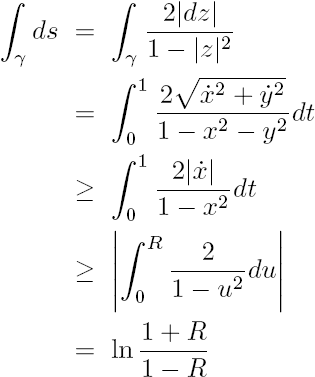 A rigid motion is a linear transformation from a vector space to itself such that the inner product structure is preserved; that is, lengths, angles and areas are unchanged by the mapping. There are three classes of rigid motions (isometries) of the hyperbolic plane: inversions through a semicircle geodesic, translations parallel to the -axis, and reflections about vertical geodesics. This is slightly different from the group of isometries of , where we have any translation, any reflection about a line, a rotation about a point, and a translation composed with a reflection (a so-called "glide reflection"). with . Note that an inversion of a polar function centered at the center of the inversion semicircle yields another polar function , and that inversions always reverse the orientation of the set upon which it acts (just like a Euclidean reflection). Also, note that two consecutive inversions through different semicircles correspond to a hyperbolic rotation, in that a single point (the intersection of the semicircles) is fixed and orientation is preserved. The formula for a reflection about a vertical ray with -coordinate is , and the expression for a translation parallel to the real axis is with . The figure to the right shows that just as two inversions can form a rotation, so can three non-collinear translations. The segment is parallel transported around the triangle is such a way that the angle it makes with the initial segment is non-zero in general (unless the triangle is ideal). 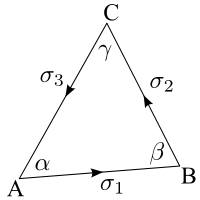 Hence, the segment has been rotated by the angle defect of the triangle. Remember, though, that translations not parallel to the real axis are not isometries, and hence are not members of the group of orthogonal transformations of . 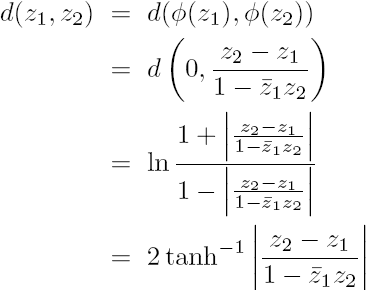 which is just the special orthogonal group of dimension 2. Since the action of on is transitive, any can be mapped to by some in the group, and we have the isomorphism , so that is actually isomorphic to the quotient group . Pretty amazing! We are now ready to examine the shape of geodesics in . Again due to the isometric nature of the Möbius map between the models, we can apply our transformation to the geodesics of the half-plane to obtain geodesics on the disk. We can see that the geodesics on the disk are arcs of circles perpendicular to the boundary of the disk, as well as diameters. 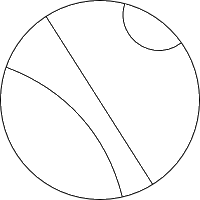 The diameters correspond to the vertical ray geodesics of the half-plane model, while the arcs orthogonal to the boundary are the transforms of the semicircles centered on the -axis. It is important to note that the boundary of the disk itself is not part of the hyperbolic space, but can be included in a compactified region just as the point at infinity can be included in the stereographic projection of the complex plane. Hypercycles in the disk model are then arcs of circles that cross the boundary (not necessarily at 90 degrees). where we have used the relation . It would now be instructive to discuss Gaussian curvature and it's relation to hyperbolic space. While the complete definition of Gaussian curvature is rather technical, we can say that it is an intrinsic measure of how a surface is curving, independent of the space in which it is embedded. To find the Gaussian curvature of hyperbolic space in these various models, we first consider the notion of a conformal metric. This is a metric which can be written as , so that the arc length is directly proportional to the Euclidean metric through some function of z. For the disk model, we have , while for the half plane we have . If the metric is conformal, we can immediately compute the Gaussian curvature of the space using , where we use . It is easy to compute for the two Poincaré models discussed thus far, and we see that the Gaussian curvature is a constant -1. The fact that it is constant means that the curvature is the same at every point in space, and the fact that it is negative means that the surface curves inward (like a saddle) at every point. It is a remarkable fact that no matter how you model or parameterize the space, the Gaussian curvature does not change, and can be computed solely from the metric.